Ok. This is exciting news. Are you ready? I bought one of those handy-dandy sunday through saturday pill containers today. Why did it take me so long? Well for one, pill containers like the one shown above remind me very much of my grandmother (who is no longer with us) and elderly folks in general. 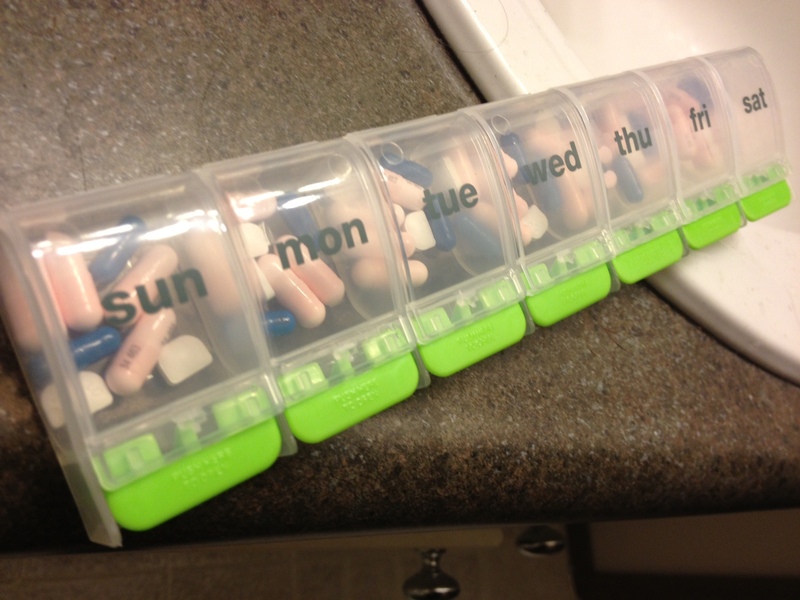 Maybe this is a cop out, but I am not elderly… which for a very long time meant (in my mind) I couldn’t own a pill container. 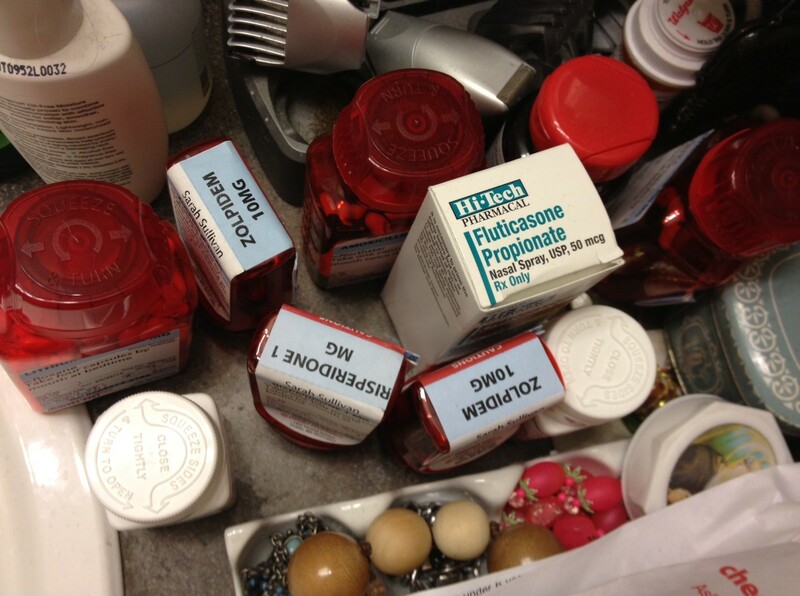 But I am too young to have a pill container! They don’t even make them in cute colors for young people, or maybe I’d consider it. Well, I’ve had a couple incidents where I took the wrong medication, or the right medication twice, or I couldn’t remember if I took it or not. Though these instances have not happened lately, I am constantly having anxiety about recreating those situations and ultimately putting myself in the hospital by accidental overdose. On top of that, I’ve been attending a group (more on that later) that was raving about the ease of taking medications from these medication containers, which left something of an impression on me. Finally, I was at Target today and noticed that, though I probably can’t fit all of the pills I need to in this container, it looked young-ish (thanks to the lime green buttons) and did not scare me off with the traditional seventies color orange that most pill containers I’ve seen seem to be. My conclusion on the bus ride home was that my need for a better system really outweighs the automatic reflex I have of shying away from these things, and if it will keep me from taking my medications wrong, clears up some counter space, and helps me travel without a second piece of luggage for my pill bottles, then I can breathe a little easier. This entry was posted in Uncategorized and tagged Bipolar, Health, mental health, mental illness. Bookmark the permalink. Great idea! I think i will get one those containers. good for you in taking care of yourself, no matter if it is stylish or not!! besides,who is going to know if your pill reminder box is stylish? but who will notice if you’re taking too much for too little of the drug? I started off using one very similar to yours. like you all my pills did not fit. this is what I use now. it’s solved three problems that I had with the boxes in your style. I’ve got one too. It’s very helpful. I even bought a fancy case to hold my medicine container. It somehow makes me feel better about all of the medicine I’m taking. I moved to a weekly organizer a few months ago for the same reason as you…made a few mistakes and then grew terribly anxious about it.